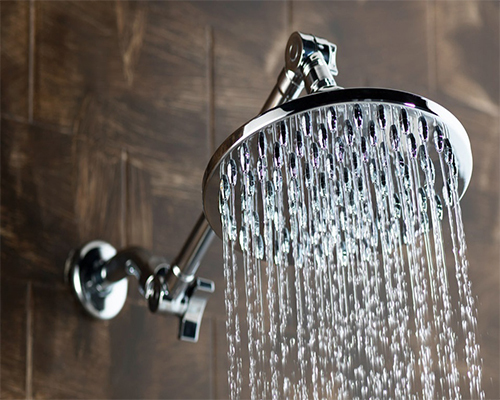 Does your shower head flow freely? Those of you who live in the north will know only too well the trouble we have here with a build up of limescale in our taps, in our kettles and all things in the bathroom including our shower heads. Why do we have hard water here in the North – Minerals such as calcium and magnesium dissolve into the water as it moves over rocks and through the ground. The level of these minerals in the water determines the water’s hardness. it is when these minerals are deposited in our appliances that limescale occurs. Although it’s not in any way harmful to your health, it does cause a build up of limescale in both your cold and hot water supply. It can also form in your appliances such as kettles, irons, water cylinders, boilers etc. One of the first areas you will notice something is not right is when running a tap or shower, the water won’t be running as freely as it should. If this is the case it usually means that you have a build up deposits and scale in aerated shower heads or a tap head. To fix this problem, the best thing to do is remove the head carefully, place in a bowl or pot and cover with white vinegar, the acids in the vinegar will help to dissolve the mineral deposits and clear any debris left. Leave it to soak for at least 30 mins or preferably overnight, the more clogged up it is, the longer you may need to leave it. Take the tap or shower head out of the bowl and rinse thoroughly in warm water, using an old toothbrush to remove any stubborn particles left behind. Keep rinsing until all the deposits have been removed, then dry off with a clean cloth and replace. you should do this on a regular basis to keep the water flowing freely, get into the habit of checking all your taps and showers every 3-6 months for any signs of limescale build up and be ready to take action! If you have a shower head that can’t be removed, then get a good strong plastic bag without any holes in it and again fill it with white vinegar and tie it up and around the shower head and leave to do it’s magic! This may look odd but it certainly does the trick and if it saves you the cost of calling out your local plumber then why not? Just remember to give it a wipe over with clean water and polish off. Previous post Avoid These Common DIY Plumbing Mistakes Next post Why Is My Boiler Losing Pressure? Your cranium must be pretnctiog some very valuable brains.